Jesus chose the most unlikely candidates to promote his message. Think of the woman at the well in John 4. She is certainly a person of reputation–five husbands, and now living with yet another man–worthy of a modern soap opera. She has other factors working against her too. She's a Samaritan, and she's a woman! (Look at her surprise in verse 9.) Jesus has one of the most profound conversations recorded in the Gospels with her. The woman's response is to go back to her village and tell everyone she knows about Jesus. Many of the Samaritans believe in Jesus when they hear he has supernatural knowledge about her life. Jesus stays in the village for two days, and many more become believers when they hear him for themselves. The woman has opened the door to an entire village. 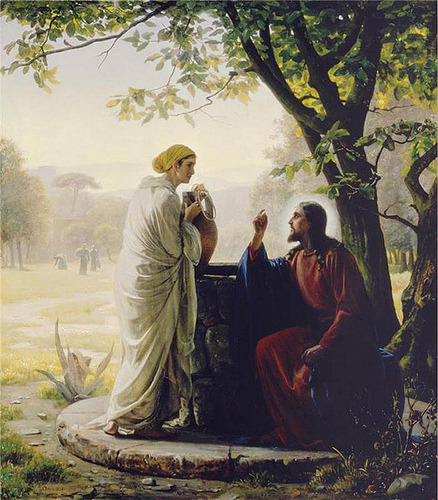 The woman at the well is a classic person of peace. She's a woman of reputation (bad) and influence. She's open to Jesus' message and she invites him into her sphere of influence. Many people follow Jesus as a result. An even more unlikely candidate is the Gerasene demoniac of Mark 5 and Luke 8. Here's a naked, crazy guy, living in the cemetery, so demonically strong that no chains can hold him. After his deliverance, and the mass suicide of 2,000 pigs, he asks Jesus if he can follow him. Instead Jesus asks him to go home and tell everyone the story of what the Lord has done for him. He lives in Decapolis–which means 10 cities. This man is also a person (son) of peace. He's a man with a terrifying reputation, (the people of that region have been warning their kids about the bogey-man in the tombs for years), but there's something about Jesus that attracts him–so much so that he runs and falls at his feet. Jesus meets his need in supernatural ways and he's restored to his right mind. Imagine the amazement in the ten cities when he shares his story . How did Jesus find these people? Jesus was always on the lookout for those open to his message. Every chance encounter might be a gateway into a new sphere of influence. He was always listening to his Father, watching for what he might be up to. I think that's why he had a deep conversation with a Samaritan woman or why he sent the ex-crazy guy back to his home town. He was in constant communication with his Father. What might happen if we look for people of peace as we go through life? If we develop the habit of listening to the Lord, who knows what unlikely people the Lord may point out to us. Do you have any stories of where the Lord has shown you people of peace? Nice blog Felicity. Welcome home. I am so glad that he choose the unlikely people. It really speaks to what is really important in life. He didn’t choose the model or the perfect and materialistic person, he choose the ones even today many would question. But he knew exactly what he was doing and we should take note of this in our daily living among others. Ken, thanks. It’s good to be home! Thomas, I agree. Even Jesus’ disciples were not learned or important people. They were ordinary blue-collar workers with no special training. Previous Previous post: Can our business help you (with healthcare problems and questions)?